A.B.C. Marketing Services, LLC is your full-service printing company and direct mail specialist. As your one stop shop for all your marketing needs. we have the ability to print anything from postcards to full color 40 inch posters and we have discount prices to save you money. 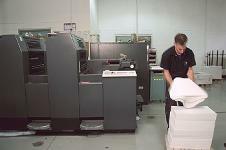 We provide Offset and digital printing. So, call our family-owned-and-operated shop today. With more than 27 years of experience, we can do it all. Delivery and pickup services are available. Contact our East Hanover, New Jersey, printing company and direct mail specialist and let us show you how to increase the sales and growth of your business. We are a family run business with over 27 years experience in printing and direct mail service .We provide outstanding design, knowledgeable and experienced service in printing and direct mail with fast turn around without sacrificing quality. Our goal is to provide the best possible service, support, and quality printing on every job. Our high quality work and service have earned us many satisfied repeat customers. Our efforts are always geared towards customers satisfaction. We value our customers and strive to create solid customers relationships every time. We focus on individual needs by working with each customer personally and provide one to one expert assistance throughout your project, from helping in file preparation to making sure the print job is delivered on time. We are here to provide service now and in the Future.